One topic, and two heated arguments ended two meetings two weeks in a row, and council continues to work on cannabis legislation that is stuck in the processing stage. 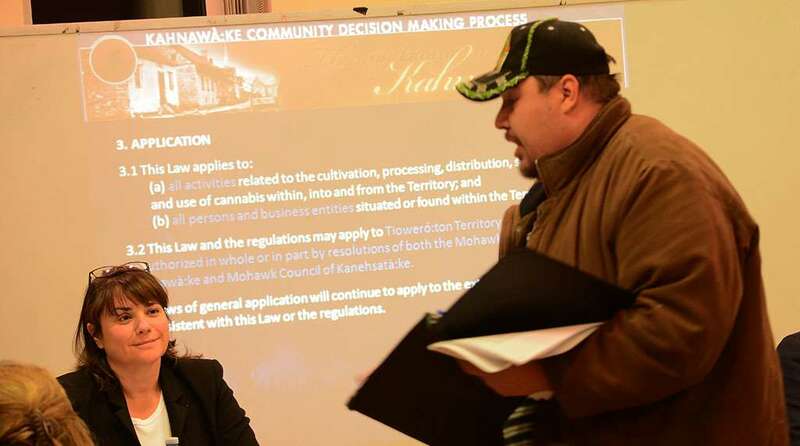 The draft Kahnawake Cannabis Control Law hearing last Tuesday (November 20) night followed a news release from the Mohawk Council of Kahnawake condemning disruptive actions during meetings. View the entire proposed law here. “There is no room for violence of any kind, threatening gestures or language, or even raised voices,” the release read. 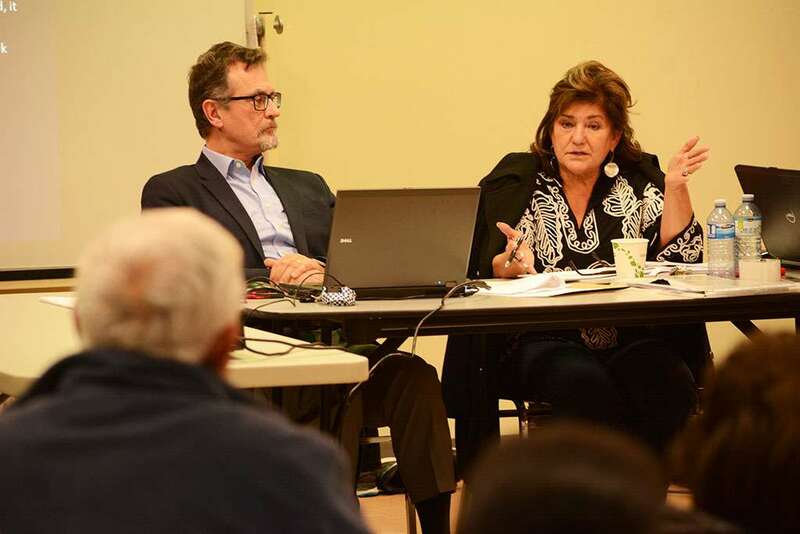 The release seemed to have little effect, as Tuesday’s meeting ended in a heated back-and-forth when community member Eileen Goodleaf approached council chief Gina Deer at the front of the room aggressively asking who sent the Kahnawake Peacekeepers to “point a gun at my grandson’s head” when the Greenleaf dispensary on Highway 138 was raided resulting in the arrest of Hank Delisle, Goodleaf’s grandson who was later charged with trafficking. Deer responded that it wasn’t her, and that Eileen’s husband Irvin has brought up Deer’s late son accusing Goodleaf of having no respect. The meeting ended abruptly with the around 50 community members spilling into the adjoining room and parking lot. Assistant PK chief and staff sergeant PK Watio Diabo told The Eastern Door that when police officers are conducting a drug-related raid like the one on the dispensary, they have their guns drawn in the low ready position, but do not aim their weapons at a suspect’s head. Before the altercation at the end, the meeting was heated at times throughout the reading of the law with community members for and against the proposed legislation bringing up aspects of the law they agreed with or opposed. Council chief Tonya Perron felt the meeting was relatively productive despite the tense moments. Council lawyer Murray Marshall read portions of the law, and summarized main points during the meeting. His summary was interrupted repeatedly, but by shortly after 8 p.m., the entire law was read. Main sticking points that arose included council’s jurisdiction in drafting the law, the law’s classification, lack of consultation and the makeup of the proposed cannabis board found in sections 10 through 14 of the law. Community member Skyler Taylor spoke during the meeting about concern over the board’s makeup, and added concern after the meeting that discussions often veer off course detracting from constructive criticism and discussion. Taylor noted that community members often return to the same points of the law repeatedly such as Jeremiah Johnson’s continual calls for the law to be reclassified as Type I (affecting the entire community) rather than Type II (related to a specific industry). Jeremiah Johnson presented a petition signed by just under 200 people at the meeting. “It was a community-created cease-and-desist letter to MCK directing them to stop moving forward with their cannabis act until a transparent, community-inclusive process is used to create the law,” said Johnson. Johnson submitted a cannabis law to the Kahnawake Legislative Coordinating Commission prior to the MCK, and has long derided council’s law. Several community members vocalized their support of the MCK drafting a law at the meeting with some adding that the support comes with qualifications. Perron and others on the drafting team plan to take the constructive criticism and go back to the law and see if the table can address some concerns. “I have a lot of notes in my copy of the draft law and there were certain comments that I agree with,” said Perron citing Johnson and Taylor’s suggestion that the board be elected from the community rather than appointed by the MCK. Perron responded to community members who’ve accused the Mohawk Council of creating a law without community input. Perron and other chiefs at the meeting spoke about the fact that community members approach councillors outside of meetings to discuss laws and policies, and that those present do not speak for the entire community. Perron added that many in the community have told her they do not attend meetings due to the, at times, toxic debate in the room. Taylor was happy to hear multiple viewpoints, but hopes future meetings can include more of a collaborative attitude.